Modern decor and Old World Italian cuisine combine for an incredible dining experience. Even before entering Bella Brava New World Trattoria, I was struck by its sheer presence. Located along St. Petersburg’s quaint, pedestrian-friendly Central Avenue, the sleek, cool architecture might, at first, seem out of place. But the warm amber glow oozing from the windows and the infectious chatter from balcony diners immediately draws you in. 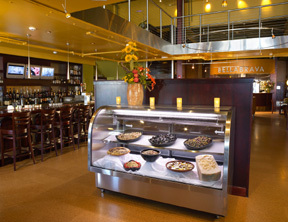 Once inside, an artful balance of warm colors and edgy stainless steel sets a modern tone, but the presence of a deliciously stocked antipasto case lets you know this place is serious about Old World Italian food. A terrific selection of music, ranging from lounge to latin, fills the space, creating a simmering level of sophisticated excitement. The interior design of the space is impeccable. Sage green walls provide a warm and soothing backdrop to oversized, metal-framed photographs, suspended by cable mounts. The ceiling, complete with industrial conduits and vents, is painted out in an appetizing mustard/pumpkin color. Small halogen spots and amber-colored pendants drop from tracks snaking all around the restaurant, each creating just the right amount of light – dim enough to be intimate, yet bright enough to illuminate the menus. Tall, dark wooden booths lend warmth, while the dining tables are made of cool, glass-topped stainless steel. Rich, muted-colored fabrics cover sensuously curved banquettes and seats. Sandblasted glass doors finish off the textural mix. A huge wine room at the back of the restaurant has an overwhelming, imposing presence, all the while enticing you to sample what is held within. The ambiance of Bella Brava is perfect – it’s hip and modern, yet warm enough to allow one to enjoy and appreciate the main attraction: the food. For our appetizer, my guest and I shared an order of the Fritto Misto ($9.95). A generous portion of fried calamari, shrimp and their signature crispy fried artichokes were served with a tomato herb aioli. The calamari were some of the most tender I’d ever eaten, the coating feather-light. The shrimp were amazingly fresh, lightly seasoned, and cooked to perfection – a crisp bite on the outside, yet moist and tender on the inside. The fried artichokes were unusual and amazing. Not only were we served the succulent hearts, but the leaves had been cut into strips and fried. The result was a thin, crispy ribbon that was almost pasta-like. The aioli, however, was a bit too heavy on the sun-dried tomatoes and the delicately fried items were just masked by its thick, mayonnaise-y quality. A better choice would have been a light, fresh marinara, or nothing but fresh lemon, which was how I ended up eating the rest of the dish. Having been seated near the wood-burning oven, we had the pleasure of seeing our entrees being prepared. I ordered the Salmone Alle Cinque Terre ($18.95), which was a salmon filet cooked atop a cedar plank. Having had “planked” fish before, I was curious to see how Bella Brava’s version compared. I was not disappointed. 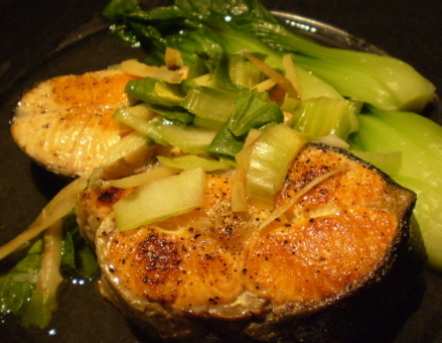 The cedar plank, blackened by the wood-burning oven, held a deliciously moist, assertively-seasoned piece of salmon. 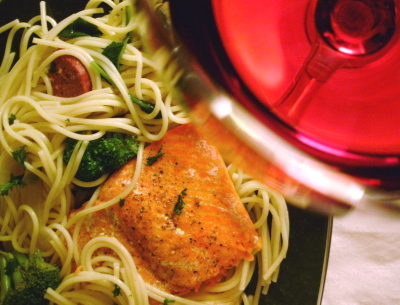 I tasted lots of pepper and fresh herbs, which stood up well to the hearty salmon. Crispy rosemary roasted potatoes and glossy roasted peppers and onions made for a beautiful and tasty plate. The potatoes were not greasy, as they can be if allowed to sit in oil too long, and the vegetables were fresh and cooked to perfection. This was a hearty, expertly prepared dish. My guest ordered the Sedanini Alla Bellabrava ($12.95). Billed simply as “Sedanini pasta with Tuscan sausage, garlic and fresh sage in a smoky and spicy pancetta tomato sauce” the dish is much, much more. We watched as the chef covered a round, shallow dish with pizza dough. He the placed the dish into the wood-burning oven, letting the top get brown and crispy. When served, the appearance was somewhat clunky and off-putting, like a huge pot pie. However, after breaking into the crust, the aromas that came out of the dish were incredible. The presentation was like nothing I had seen before, and the dish itself held so many delicious morsels, it was like going on a treasure hunt! The Tuscan sausage is made on site, and is a delicious and well-balanced blend of heat and sweet, laced with fennel. The fresh pasta was thick and hearty, well-matched to the rich, chunky sauce. The browned pancetta bits were smoky and salty and the fresh sage gave the whole dish a wonderful perfume. This was truly an outstanding dish. Dessert did not disappoint. The Ripiena di Chioccolato ($5.95) is a chocolate flourless cake filled with chocolate ganache. Straightforward but wickedly rich, the jewel-shaped cake was the perfect ending to an amazing meal, and went well with my glass of Feudo Arancio Merlot ($6.97). The bar area is equally as impressive as the restaurant area, and is sure to become a hotspot for having cocktails. My Absolut martini, a bargain at $6.50, was well-chilled and served in a generous glass. Service was relaxed and efficient; our friendly server Tiffany was courteous and helpful. The bartender and hostess were equally accomodating, and there was not a hint of being rushed, even after we arrived within an hour of closing time. 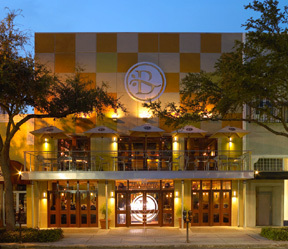 Our experience at Bella Brava was excellent. The combination of a sophisticated decor, good service and well-prepared traditional Italian cuisine should be a big hit. 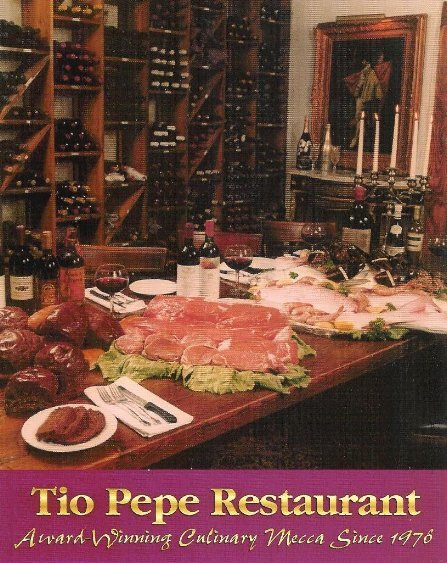 The menu offers many other innovative dishes, and I look forward to trying them when I return.